Hi Everyone! Hope you are all well and are having a good week. I've been working pretty much everyday and I am so exhausted however it's going to be worth it for all the holidays I have booked later on in the year. If I haven't yet mentioned I am so incredibly excited to travel a lot more this year. Anyway, enough about that. Today I thought I'd do a little bit of a light hearted post all about having long hair. Having long hair is something I've had pretty much my entire life. I had a lot of hair when I was born and to be honest I've never really wanted to cut my hair. I did once when I was in my second year of secondary school and I regretted it so much and have never cut it since. I really like long hair and as much as I would like to cut it I just can't gather up the courage. Over the past year or so my hair has grown so much and I don't even know how. If you have long hair then I'm sure you'll be able to relate. I hope you enjoy this post. Like seriously, it's ridiculous where it ends up. In the sink, on the floor, in the toilet, in the shower (even when you're not in it hair somehow ends up there). My Dad literally has a fit. Me and my mum both have long hair and it always ends up everywhere oops. It was even worse when my cousin was here over Christmas as there was just too much hair. It's honestly a nightmare. It's like I'm malting. Sometimes I'm convinced that there is more hair on my hairbrush than on my head. No that is not an exaggeration. 'How do you grow it' 'Do you straighten it' 'Do you dye it' 'Have you ever cut it'. Oh my goodness it's so frustrating. The how do you grow it one always makes me laugh...like, I honestly have no idea? I don't cut it and I don't use much heat I guess and I never dye it either. I guess this is why there's no other in depth explanation. People always seem to think there's some big theory or scientific fact and sadly there just isn't. My hair is really thick and for work I have to put it up in a bun and it's so frustrating to 1. find hairbands that can go around my hair enough times that's it tight enough and not too loose and 2. find a hairband that's big enough to go around the bun once it's up. The amount of bands I've broken just trying to do my hair is ridiculous. I have an old vaseline tin on my dressing table where I keep all my hair ties and bobbles and sometimes it takes me 15 minutes to find one. If you want a good work out doing your hair on bad hair day is the best as your arms will get a seriously good work out. Mine has not wanted to co-operate a lot lately and when I constantly take the band out to put it back in and keep redoing it, oh my goodness my arms just cannot take it anymore. My hair is so long and so silky and shiny that it just never curls. I made the mistake before Christmas of going to the hairdressers to get it curled and it took about an hour and a half however when I got home the curls had pretty much already dropped out. £50 that cost me. What a waste?! It's honestly so frustrating. I love curly hair but I can never have it because it just doesn't stay in place which is super annoying. If anyone with long hair reading this can relate but perhaps has found some miracle of getting curls to stay please let me know. I'm okay with people playing with my hair, like it's one of my favorite things ever especially when I am sad but when people just lean over and stroke it. I am not a cat or dog or remotely resemble a cute fluffy animal. Just do not do it unless you want me to whip you with said hair. I do a pretty good 'whip my hair back and forth' when I want to. Yes unfortunately long hair means knots. Knots that are impossible to get it. Knots that you get out but somehow they are still there. I've lost count of the times I've thought I've got rid of a particularly bad knot only to brush through the area again and somehow somewhere there is still one lurking about. Most frustrating thing ever. Top tip from me to you though, never go to your Mum to help you especially if she's in a bad mood...you'll not only have no hair left but practically no head either. When you have hair so long that you can almost practically sit on you sort of lose patience when it comes to washing and drying it. This is where dry shampoo comes in. I go through about a can of this stuff per month. My favorite to use at the moment is the L'Oreal extraordinary clay one as it's just so good but if your hair is looking a bit lifeless and dull and even a tad bit greasy at the top then I'm sure we can all agree that dry shampoo is a savior when it comes to these situations. I have really enjoyed writing this post. 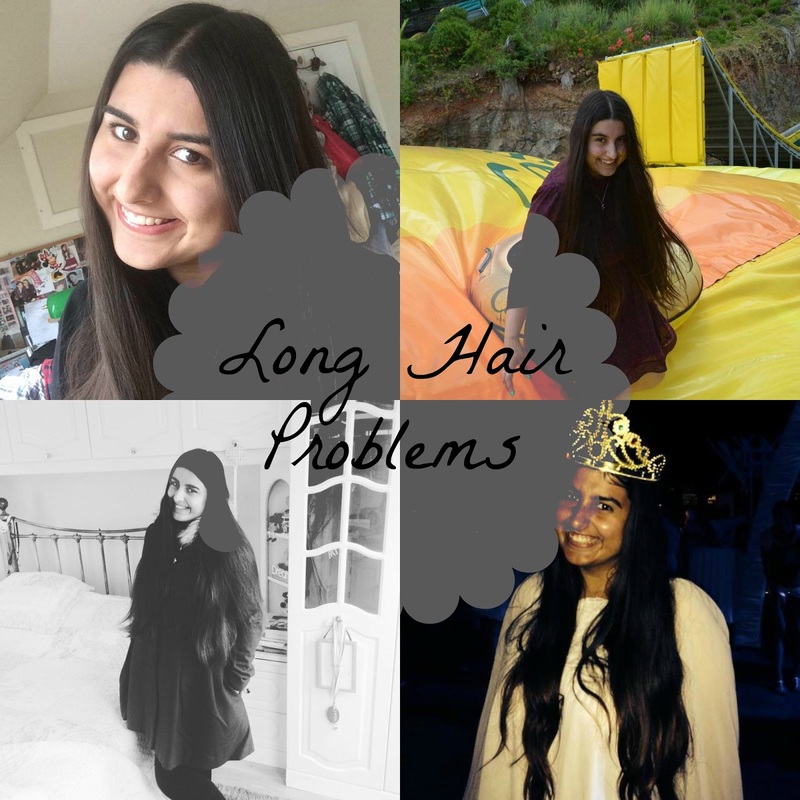 I've been using the expression long hair problems a lot lately and as today I was having a particularly bad day I thought why not do a post all about some long hair problems that other ladies and maybe even gents (yes ladies we aren't the only ones with long hair) can relate to. Let me know if you relate to any of these along with any tips for taming long hair. It would really be much appreciated. What are some other long hair problems you can think of?